If you are at all afraid of heights, you do NOT want to climb up here! 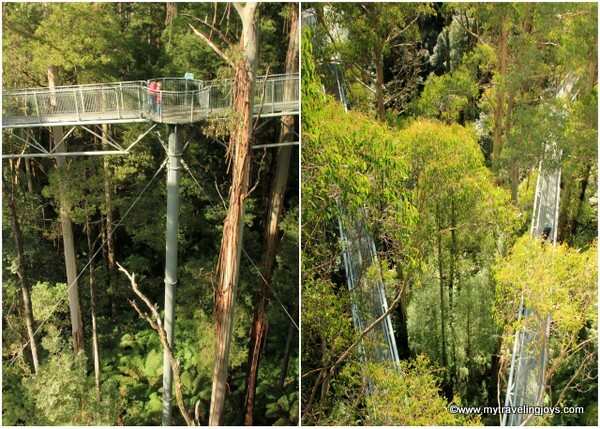 Located just 19 km off the Great Ocean Road, the Otway Fly Treetop Walk boasts itself as the highest and longest steel canopy walk in the world – and it’s found right here in Australia. I’m all for adventure, but I freaked out a bit when I first stepped out onto the metal walkway – 30 meters (about 8 stories) above ground level! If you're an thrill seeker, you can even do a zipline through the forest. Looking down, all you see is lush palm trees, greenery and a jungle of trees – mainly Myrtle Beech and Blackwood trees. It almost looks like a scene from a Jurassic Park movie – as if you’re waiting for a pterodactyl to come swooping down out of the sky! In fact what you’re looking down at is the Otway Cool Temperate Rainforest – a landscape that dates back 140 million years to Gondwana when dinosaurs roamed the earth. I’d never heard of a cool temperate rainforest until this trip, but the Otway Rainforest exists because of a lot of rain, in fact the highest rainfall in Victoria. The Otways are the most westernly located cool temperate rainforest in Australia. Starting from the visitor’s center, the walk is a 1.9km round walk and takes about 45 minutes or so, depending on how many photos you want to take. There are several interactive panels along the way with information about the surrounding to one hour to complete. In the middle of the walk, you also can climb up a 45-meter high tower via a spiral staircase. You’ll be rewarded with even more amazing views over the rainforest and the fellow walkers below. Walking through the Otways here you’re reminded just how diverse and gorgeous Australia’s scenery is! 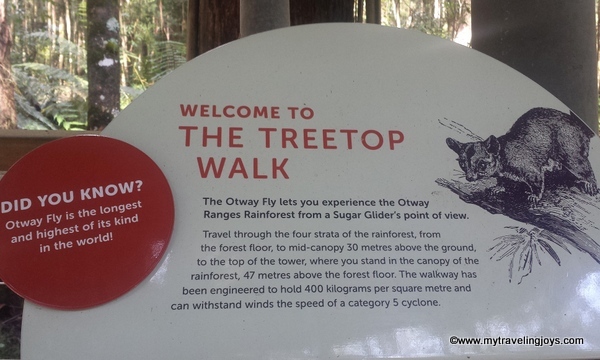 Don’t miss the Otway Fly Treetop Walk when you visit the Great Ocean Road! I swear, the tree was this big! Awesome pictures. Looks like an amazing adventure. Glad you are making the most of your time in Australia. Keep on posting pictures and blogs about your great adventures. I love reading all about them. Worth conquering a fear of heights for the experience. i would love to do this but it's the height thing again. it is beautiful!